Is your lawn or garden being destroyed by moles? Do you want a non-chemical solution to your mole problem? If so then you have come to the right place. CCP Wildlife Control LLC handles residential or commercial mole control and offers many different options to meet customers needs. For large areas or areas with reoccurring mole problems we have mole control maintenance plans where we constantly are checking and control the mole problems. For smaller residential problems we are able to come in and remove the moles from your yard or garden quickly to stop the damage. In order to control mole problems you need to understand what moles are and what they do. For more information check out our Oregon Mole and Gopher Control website. You can find great information about vole, gopher, and mole control. Mole, Gopher, or Vole Raccoon Skunk Beaver Squirrel Coyote Rodent Bird Bat Dead Animal Removal Attic Clean Out or Sanitation I have NO idea!! Due to the amount of tunneling moles do to find food they can eat up to almost their body weight each day. Moles tunnel are used to help the moles find insect. When insects, larva, and worms borrow into the ground they often enter the moles tunnel that the mole travels through waiting for these insects. Moles can dig tunnels at 15 to 18 feet an hour which can mean they tunnel up to 200 feet a day. Moles are offend thought to be rodents but they are actually mammals. Is your garden or yard being destroyed? Do you have dirt hills on your property with a hole coming out of the mound? If so you most likely have gophers. CCP Wildlife Control LLC can handle residential and commercial gopher problems. We offer maintenance plans for large areas or areas that have gopher problems that reoccurring each year. For smaller residential problems we are able to come in a setup and quickly removal the gophers before they can cause more damage. Gophers build complex underground tunnel systems. They use there front legs and teeth to push the dirt into the grass or above ground. Gophers breed from early spring to early summer and have one litter from three to seven young per year. The young gophers will stay in the nest for five to six weeks. Gophers normally have a population of 2 to 20 per acre. Do you have small hole's throughout your yard? Do you have little runways and dead grass patches in your yard? You could have a vole control problem in your yard or garden. Vole's are common pest animals throughout the Portland, Oregon metro area and are found in many yards or gardens. Voles create small holes about the size of golf balls throughout a yard. Theses holes are usually clean looking without dirt mounds next to them. Your will be able to see vole run ways in areas of high vole activity. Vole's will also eat the grass down around holes of high activity. Most people do do not even know what a vole is due to the fact they are rarely seen. They look very similar to a mouse but have a shorter tail that has hair on it and have bigger ears. Removing voles at first sign in a the best way to prevent a large problem from growing. 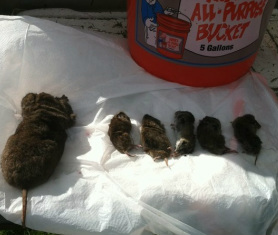 When trying to solve this pest problem many people want to use vole repellent or vole poison. We have found these methods to not be very successful. Voles commonly use tunnels created by moles or gophers. Voles will use runways above ground, but spend most there time in the tunnels. You can test a vole hole for activity by baiting it with an apple. Voles are green vegetarians, but will eat insects. Vole can chew on tree roots, which can cause damage or even kill the tree or plants.